Successfully Added Rugged Outdoor Watch - IP67 Waterproof, Pedometer, Distance Tracker, Calorie Counter, Heart Rate, Blood Pressure, Sleep Monitor to your Shopping Cart. This rugged Bluetooth watch from SportsMaster is the ultimate gizmo for outdoor lovers. The watch itself has a cool rugged design and features an IP67 waterproof rating. Thanks to this, your smart watch is waterproof and resistant to drops, shocks, and dust. You’ll be able to wear this beauty anywhere without needing to worry about accidentally breaking it. Your watch has a traditional Quartz needle display as well as an intergraded mini digital display. The latter allows you to easily check the time after dark and furthermore lets you use the watch’s other smart health and fitness features. With over 20 basic functions, this Bluetooth sports watch is sure to meet all your outdoor demands. To motivate you to stay active, your watch features a pedometer and distance counter. It furthermore lets you see how many calories you have burned throughout the day. Additionally, your smart watch lets you check your heart rate and blood pressure at any given moment. All data can be read instantly from the digital display or be analyzed into more detail when using the mobile App on your iOS or Android phone. Within its rugged body, this outdoor watch packs a 250mAh battery that features all its Bluetooth functions. This cell gets you through a week worth of usage time. Therefore, you won’t have to worry about constantly recharging your gizmo at the end of every day. With a call and message reminder in place, this smart watch makes sure you’ll never miss out on an important update again. Your watch furthermore supports a digital alarm clock, sedentary reminder, and sleep monitor. With an abundance of smart functions available, this smart watch is sure to meet the likings of all outdoor enthusiasts. 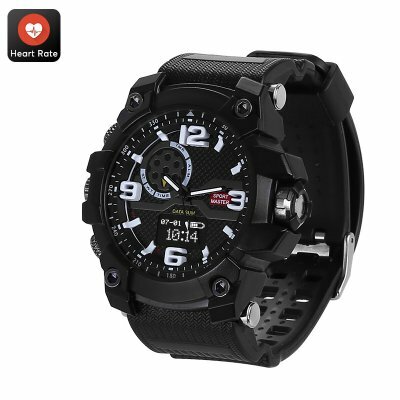 This Bluetooth outdoor watch comes with a 12 months warranty, brought to you by the leader in electronic devices as well as wholesale smart watches..